J. R. Knapp and Edward Townsend were partners in the banking firm of Townsend and Knapp. They were also brothers-in-law, having married sisters. 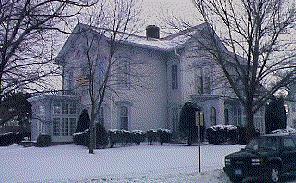 Knapp built this house in 1867, but both families lived in it. It was considered to "rank among the best residences in our large city." Tragically, both sisters died within a year of each other. Townsend built a new house and left the banking business. In 1879, he was a founder of Townsend and Merrill Lumber Company. Knapp stayed on in the house until he lost his bank during the depression of the 1890s. He left Cedar Falls a broken man, and later committed suicide. City Marshall John Schuneman, who owned it until 1920, purchased the house from the Townsend estate in 1905. The Cedar Falls Women's Club acquired the house in 1929 through the generosity of Gus and Henry Pfeiffer, who gave $10,000 to the project in honor of their sister, Emma Pfeiffer Merner. The gift was matched by local contributions. The Knapp/Townsend House is Italianate in design, with double round headed windows, a highly decorated bay window, and details and brackets under the eaves and around a round window. Later additions, even when not strictly Italianate, have tended to complement the original structure. Mortimer Cleveland designed the Ballroom addition to the home. The rose window, additional smaller windows of stained glass and an original stairway have been retained in the refurbished interior, as has much of the ornamental woodcarving. The house has been preserved as a beautiful yet functional landmark of Victorian Cedar Falls.